I've known David Yurkovich and followed his work for just about the entire time that I've been covering the comics field--a period covering ten years, more or less. Yet, despite all the great conversations we've had, and the extreme pleasure his work has delivered time and again, I somehow haven't talked to him in my official capacity as a journalist before now. Still, as much as he's deserved that coverage in the past, I honestly don't think there's been a better or more opportune time to talk with him than at this particular moment. Bill Baker: Let's begin with a bit of sadly necessary background: Who was Bill Mantlo, what did he accomplish in comics, and why is that important today? David Yurkovich: Bill was a comic book writer for Marvel Comics. He began writing comics in the early 1970s, initially writing the "Sons of the Tiger" strip in Deadly Hands of Kung Fu. He worked with George Pérez on the series, and the pair co-created The White Tiger. Bill later moved onto Marvel's color comics, penning hundreds of stories and sustaining long runs on The Incredible Hulk and Peter Parker, The Spectacular Spider-Man. It was on the latter series that he co-created Cloak and Dagger (with artist Ed Hannigan). Bill also wrote two highly successful licensed series for Marvel-Micronauts and Rom: Spaceknight. Bill's writing has influenced many other authors, including current Hulk writer Greg Pak, and Y: The Last Man author Brian K. Vaughn (both of whom contributed to the benefit project). His work has stood the test of time; he should not be forgotten. BB: Bill's work has obviously had some real impact upon, and importance to your life. What was it about his work that captured your imagination, and heart? DY: I think it was Bill's own imagination and heart that he put into his stories that appealed (and still appeals) to me. If I picked up a comic book in the 1970s or '80s and saw Mantlo's name in the credits, then if nothing else I knew I was going to be treated to an entertaining, imaginative tale. Month after month, his work on titles like Micronauts, Rom, The Incredible Hulk, Marvel Team-Up, Spectacular Spider-Man, etc. was solid. He was a terrific plotter who knew how to write good stories that could appeal to a mass audience. If Marvel had done a writer's companion book to its successful How to Draw Comics the Marvel Way, I have no doubt that it would have included samples of Bill's work. BB: What lead to the creation of the Mantlo: A Life in Comics project, who's been involved in making it happen and what have they done to make it a reality? DY: This project developed because for a long, long time I've wanted to do something for Mr. Mantlo to thank him for his legacy of comics work. We often see tribute books showcasing the work of artists, but far less often does our industry honor its writers-not that it never happens, but more often the focus is on the art. In speaking with comic book fans, I was surprised just how few had known about Bill's accident. I consider myself a huge fan of Bill's work, and I was unaware of his accident until the late 1990s. So I wanted to raise public awareness, because Bill wasn't a writer who wrote comics and then left comics. In a sense he did-that is, he did leave comics and became a successful lawyer-but I think that, had he not been in a serious accident, he'd have returned to the medium. Writing was Bill's passion; I have no doubt that he'd have returned to comics. As to who's been involved in making this project happen, I really don't know where to start. So many have given of their time and have offered vital financial support. I've received support from Bill's family and friends, industry colleagues, comic book retailers, fans of Bill's work, Hero Initiative, CBIA, Diamond, and Lebonfon. Really, from start to finish I've gotten tremendous support. To me, at least, it is a testament of Bill's legacy. BB: What do you hope to accomplish with this book in the short term? DY: I suspect this project is mainly going to appeal to Bill's fans, both in the US and overseas. This book is both a tribute to Bill and an overview of his life before, during, and after his lengthy tenure with Marvel. So, for the short-term, I hope this project will serve to provide fans with a bit more detail into Bill's life. Bill's departure from Marvel was rather sudden considering the many years he'd worked for the company. This project provides a few answers as to why Bill left Marvel and what he sought to (and did) accomplish post-Marvel. BB: How about the long term? DY: Well, of course I'd like to see Bill inducted into the Eisner Hall of Fame. If this project raises awareness about Bill's accomplishments-if it does anything to help solidify his name in the annals of comic book history, then I'll feel that I've succeeded. I don't know if this is possible; I know very little of the mechanics and politics that surround the Eisner folks, but that's what I'd like to accomplish with this project in the long term. Also, I hope that this project might inspire others like myself who may have been influenced by Bill, to put together their own tribute, be it in print or on the Web. BB: So, how can readers, creators, store owners and just plain folks help things along? Is it just about buying one or more copies of the book, or are there other ways that they can contribute to this cause? BB: As if the above isn't enough work, you've got another book coming out in the near future. What is Death by Chocolate: Redux, and for the uninitiated, what can you tell us about this book's characters and the world they inhabit? DY: Death by Chocolate: Redux is a trade paperback collection of stories, most of which were originally published in pamphlet (standard 32-page comic book) format. It is volume 2 in the Less Than Heroes library that Top Shelf is producing, though the stories in Less Than Heroes: Threshold (volume 1) and Redux (volume 2) are completely separate. Same universe, but separate cast, separate themes, separate everything. 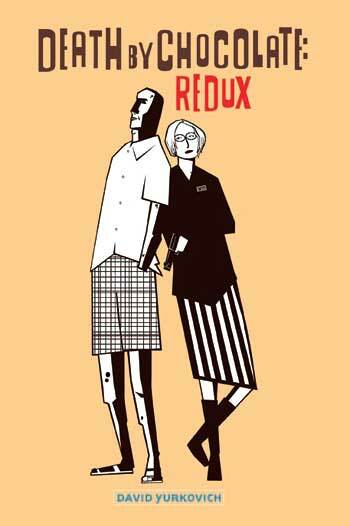 The Redux stories encompass a multitude of genres including drama, comedy, sci-fi, adventure, horror, super-hero, nonfiction, and crime. The series protagonist is an ordinary man who is unintentionally transformed into an extraordinary being comprised of organic chocolate. He must learn to cope with this transformation, and he's eventually recruited by the FBI as part of its Food Crimes Division. Agent "Swete" (as he's dubbed by his colleagues), is paired with (a straight-laced, by-the-numbers female agent; the pair engage in a variety of adventures, encountering weird circumstances, a talking canine, Ernest Hemingway, mobsters, and others along the way. At its core, Redux is an adventure series, but its protagonist is in every way an unlikely hero. BB: Where did all of this come from? When did you come up with the idea for this book, how did you develop it, and how does the final product compare with your earliest vision of it? DY: The Redux collection includes a lengthy essay on the genesis of the character and the stories, but essentially the Death by Chocolate "universe" began in 1994 under the working title The Chocolatier. I wrote and drew a short story but never published it. A year or so later I returned to that original story, dusted it off, expanded upon it, applied for and was awarded funding by the Xeric Foundation, and immediately began to produce sequels. As for how the final product compares with the earliest vision of it, well, it was definitely an evolution. I wrote the first story-the origin story-having never written anything more than a few pages. I'd done plenty of story outlines, but these were typically very short-the sort of stories you'd likely find in old issues of Tales of Suspense (pre-super-hero era) or in anthology-type magazines like Epic Illustrated. 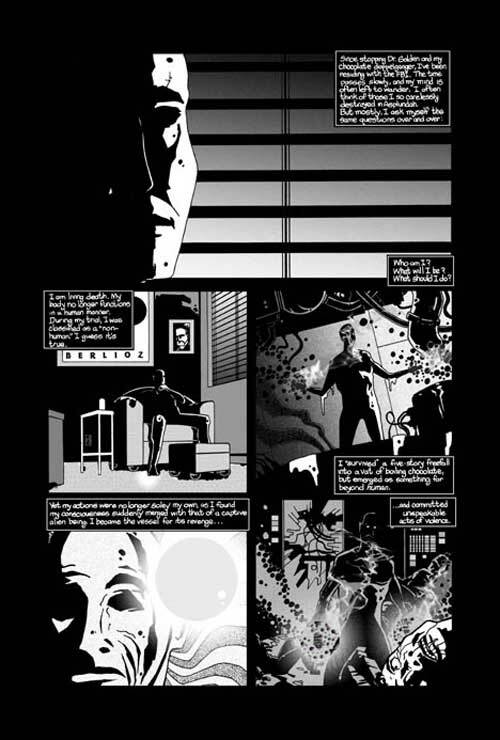 Once I broke the barrier of writing and illustrating a longer piece like the origin tale, I began to grow increasingly confident in my ability to tell full-length stories. Both the writing and the drawings evolved as I worked at honing my craft (and really, I think that for most of us, we hone our craft until we retire or die, whichever comes first). Fortunately, I was able to make significant refinements to the stories that appear in the Redux collection. I spent several months cleaning up and redoing panels that looked amateur and also wrote and illustrated a new short tale that that's never before seen publication. The end product is something that is much more fully realized than the original comic book stories. Also, Robert Venditti (author of wonderful Surrogates series) did a fantastic job editing the book and adding credence that a writer is only as good as his or her editor. BB: What's your creative process when it comes to actually creating comics? Do you just start with inspiration, and dive directly into getting it down on the page visually; do you create a full script and follow that carefully; or is it a bit more complex and different than those approaches? DY: Most of the time the initial drafts are stream of consciousness. That is, I seldom write out point-by-point outlines but instead will dive into a story with little more than a vague concept of what I want to do with that story. I carry a notebook with me most always, and I try to write as often as possible. Generally speaking, I'll develop the story and layouts simultaneously, asking myself questions along the way and introducing the characters that inhabit the story. Usually, the characters will begin to develop and then "write" the story for me. That is, the story itself will evolve and turn based on the characters that inhabit it. Sometimes a story will just stop-that is, I'll hit a wall and just have nowhere to go with it. In those instances, I'll put it away and pick it up again a year or so later. Did this with a few stories and it always seems that distancing myself from it-basically forgetting all about it for a while-seems to work wonders. Nearly always, if I take a break from a story that has stalled, I can pick it up later and know where it needs to go and how to get it there. More often than not, asking questions will drive the story; I find that one of the best questions to ask is "what if...?" BB: What's the hardest part of scripting for you? And how do you know when you've captured the proper voice for you characters, or even for the overall tone of the book? DY: It's sometimes difficult to give each character a unique voice, because if you're writing a team of four laid-back super-heroes who are all approximately the same age, and who seem to all share similar sensibilities, then it's easy to fall into the trap in which their dialogue becomes so similar as to be interchangeable. When I created the Threshold super-hero comics (later collected as Less Than Heroes), I worked hard at giving each character a unique voice. Once that voice is established, the scripting comes naturally. Sometimes a character's dialogue just doesn't ring true to me. In those instances I'll rewrite and rewrite until the voice clicks with the character's visual look and/or actions. Knowing you've hit upon it becomes more or less instinctive, and again, once the characters' voices are found, the stories sort of begin to write themselves. BB: How important is the visual narrative, the flow of the storytelling, to your work? And how important is the design of the overall page in your work? DY: Visual narrative is extremely important. In our medium, the words and pictures work in concord such that if either is weak, then the overall story suffers. As to the design, I tend to use grids (3, 4, 6, 8, or 9 panel) like Ditko or Kirby did in the early 1960s-they may have used grids earlier than this, but in the comics I've read from the early ‘60s, 6-, 8-, and 9-panel grids were often used. 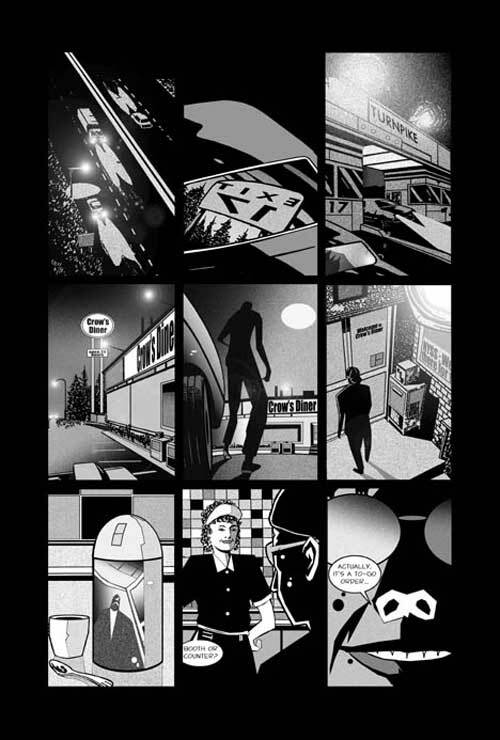 I like the grid because it treats each panel with equal importance; it also challenges me artistically to take what is basically a generic panel layout and to fill the layout with illustrations that both drive the story and are visually appealing. I guess I'm from that school of thought that regards the comic book page as a series of storyboards. When there is occasion to emphasize a particular scene, I'll deviate from the grid. BB: What does creating comics do for you, personally or professionally? Does it fill a need inherent to your make up, or is more of a fun thing for you to do? DY: Whether the end product is a comic book or graphic novel, a series of illustrations for a children's book, a Web page, or fiction or nonfiction, it's all part of me. I feel restless often and sometimes find it difficult to passively enjoy watching a movie or reading a book because I feel a need to be an active participant. Creating comics is first and foremost a personal passion. I'll typically write a story and complete the breakdowns and rough dialogue and then work at developing the breakdowns into finished pages. Generally speaking, I have a lot more time to work on writing and layouts (because these can be done virtually anywhere-on buses, trains, planes; at the beach; while standing in line at a theater, etc.) and very little time to sit at a desk and produce finished art. As a result, I've built a fairly large backlist of stories that are ready to go; that is, they are ready to be taken from penciled roughs to finished art. But I realize that these stories might never see publication based on my available time. So it's just something I have to do. If the prime motivating factor was to see my work in print, then I'd probably be dedicating more time to design work since design work is, for me, a much faster process than penciling/inking/full rendering. Lately I've been working exclusively at the breakdown level, seeing if I can take a pencilled rough and turn it into a finished page in less than 10 or 12 hours (which is usually the time I'd spend on a given page). The Bill Mantlo book includes an all-new six-page story ("Aftermath") that I was fortunate to be given an opportunity to adapt. I worked from my pencilled roughs and then produced a second set of pencils that were a bit less rough. Those pages were then scanned and refined in Photoshop. It was a lot different for me, working this way, but the advantage was that I could do this work from various locations-I didn't have to be at a drawing desk since my laptop computer became the desk. Overall, I'm pleased with the results, though I'm not entirely sure the end product is representative of the style I've been trying to refine and define over the years. It's a very different look for me art wise, and I have no idea if it'll be viewed favorably or if it'll be savaged. But I think it works for the story. 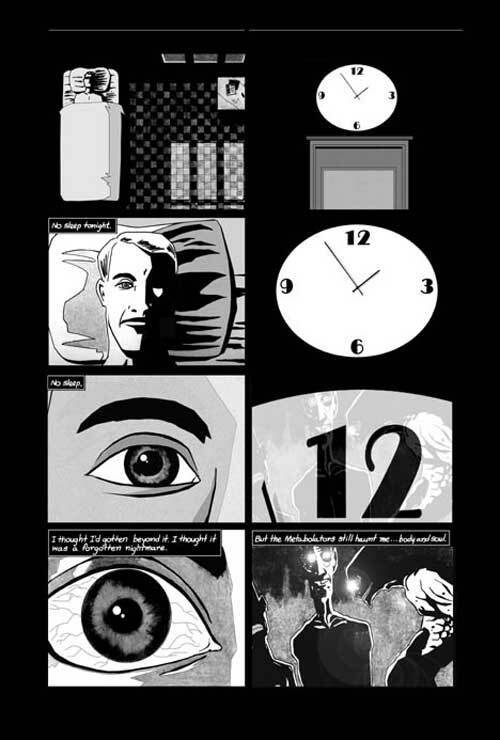 More recently, I completed seven pages for another project. This time around, I produced seven pages of roughs, turned the pages over and placed them on a light box. I then inked the roughs. Afterward, I scanned the pages and rendered them in Photoshop as I did the Mantlo pages. There's a bit less deviation in this from the usual look of my work, so it was a bit easier for me (as my own critic) to accept the visual look of these pages. I'll likely continue to experiment like this for a while until I'm either comfortable with the look of the end product, or I'll return to the traditional drawing desk. It's difficult to gauge at this point, but as far as having fun, it's a lot more fun to incorporate the computer into the drawing process and it's a lot less restrictive. BB: You also do design and editorial work. What do each of those endeavors offer you, aside from filthy lucre, that comics might not provide? DY: I work as an editor full-time, so doing editorial work is second nature to me. Working with words is fun and challenging. Working with an author's manuscript can be quite challenging and is at times akin to walking a tightrope. As writers, we think that every word we put to paper is perfect. But everyone needs an editor, and a good editor can beget a better writer. My first prose novel (Banana Seat Summer) is under agency representation. Before it was accepted it underwent four separate edits. My wife, Dianne, edited it; Di's edits were brilliant-so good, in fact that I was taken aback. But then it underwent three more edits before my agent accepted it. But going into the whole submission process, I thought the manuscript was perfect. It wasn't, and in my experience no manuscript is ever perfect. So the process of editing can be quite enjoyable, if you are partial to working in words. Visual design is just fun. Taking a concept and producing a graphic representation of that concept is fun. Taking a concept and, using text only, turning it into a viable design is fun. I guess the operative word here with regard to design is, it's fun. BB: And what does working on the Bill Mantlo book give you? Is that giving you something utterly unique that all your other activities don't supply? DY: I was losing sleep. I dedicated my 2004 graphic novel (Less Than Heroes) to Mr. Mantlo. But I wanted to do a lot more. Finally, I did what I usually do when my mind is too full to allow sleep: I decided to write. It's really just a payback to Bill for the inspiration his work gave to me, and for a note of encouragement he wrote to me years ago; it helped keep alive my dreams of becoming a successful comic book creator. So, this project is more personal to me than the average comic book or graphic novel would be. Even though I've never met Mr. Mantlo, I do feel as though I know him. Although his accident has severely compromised Bill's mental faculties, I hope that when he sees this book he'll recognize it for what it is-a tribute to a great writer and a long overdue thank you. I am very fortunate that so many of Bill's colleagues shared with me their stories about Bill and that I could share them with others. Bill's work continues to be influential. Both Greg Pak and Brian K. Vaughn contributed poignant testimonials regarding Bill's influence. 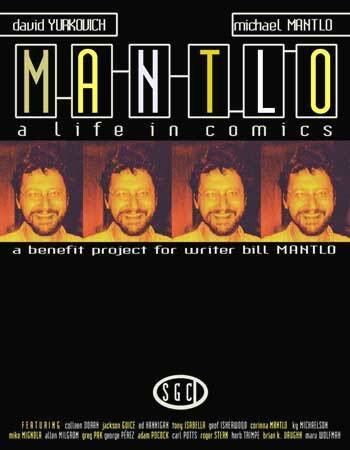 Mantlo does matter, and I hope that in some way this benefit project helps to inspire fans to discover (or rediscover) Bill's work. BB: What do you hope people get from that charity project? DY: Again, I hope that fans and the general comics-reading public will gain a deeper understanding about Bill and his work. He was a driven, dedicated professional writer and an accomplished attorney. His legacy at Marvel lives on in the reprinted Marvel Essentials line (because, quite frankly, his pen touched nearly all of Marvel's books in the 1970s, from Amazing Spider-Man to X-Men, and Marvel has been producing a ton of reprint material in recent years). On a personal note, I'd love to see a Bill Mantlo Marvel Visionaries [series of collections]. BB: How about your comics? Is that all about entertainment, or might there be something else you hope they get from them? DY: Well, I'd love to gain a bit of commercial success from my comics work to help support my family. I'd love for my comics work to lead to other projects. Mainly, I'd like to spend more time writing and less time drawing. Several of my recent pitches are with an editor now, and I'll be pitching at San Diego. As to whether the work is all about entertainment, almost every story I write has a deeper meaning than just heroes and villains in masks punching one another-at least, I certainly hope so. The costumes are the icing, but there are plenty of layers to the cake, be they layers that focus on social concerns, political allegories, religion, or interpersonal relationships. I like cake-both the desert and the band. BB: Anything else you'd like to add before I let you get back to work? DY: I may be sounding like a broken record, but I'd again like to reiterate my thanks to everyone who gave of their time and/or their pocketbook to help the Bill Mantlo book grow from an abstract concept to a fully realized finished product. I could not have done it alone, and even if I could have done it without the help of others, it wouldn't be the book that it's become. It was truly a group effort, and I'm very indebted to folks like Tony Isabella, Marv Wolfman, Mike Mignola, Greg Pak, Al Milgrom, Mike Mantlo, Corinna Mantlo, and many, many others. I'm also grateful to Brett Warnock; he did a fantastic job designing Less Than Heroes: Threshold and Death by Chocolate Redux. His design sensibilities mesh perfectly with the source material, and each volume compliments the other.